Road F980, west of Jökulsá, leads to Illikambur (25 km). This road is only suitable for experienced drivers on big jeeps with high clearance. On the way, you will have to cross the deep and fast flowing Skyndidalsá river. Please do not attempt to cross this river on a small jeep like Suzuki Jimny, Suzuki Vitara, Honda CRV, Toyota RAV or similar cars. Your will end up sitting on the roof of your car, waiting for the rescue team to pull you out. In case you get stuck in the river, call 112. From the parking site at Illikambur, it takes 30-45 minutes to walk down to the mountain cabin in Kollumúli (very steep scree slope). On the eastern side of Jökulsá, a gravel road leads to Austurskógar. The first 7 km to Hvannagil are accessible to all cars. From Hvannagil, a 4x4 track leads further into Austurskógar (usually accessible to all jeeps, ask for road conditions at Stafafell). From there you can walk to Eskifell and onwards to Kollumúli. The hike from Hvannagil to the footbridge over Jökulsá is appr. 15 km. The hike from the footbridge to Kollumúli is another 10 km. A 14 km long jeep track leads to the mountain pass between Hofellsdalur valley and Skyndidalur valley. On the way, you´ll have to cross the Hoffellsá river several times. This track is only suitable for experienced drivers on big jeeps. From the mountain pass you can hike down into Skyndidalur valley and omwards up the Sauðhamarstinder peak. On the way you´ll have to cross the Lambatungnajökull glacier. This difficult trail is only suitable for experienced hikers with the right equipment (crampons, ice axes, etc.). On the way up to Sauðhamarstindur you´ll have to pass some very steep, loose rhyolite scree slopes, that can couse some problems. The trail is not marked. Although the map shows a campsite in Skyndidalur, there is no facilities there (but of course you can camp there). A 23 km long jeep track south of Geithellnaá river leads to the small mountain cabin at Leirás. This road is only suitable for experienced drivers on jeeps with high clearance. In spring, the road often gets damaged, so it is advisable to get information about the actual road conditions from the local farmers. From Leirás you can walk to the Víðidalur valley or to the mountain cabin "Egilssel" at Kollumúlavatn lake. These trails are not marked. 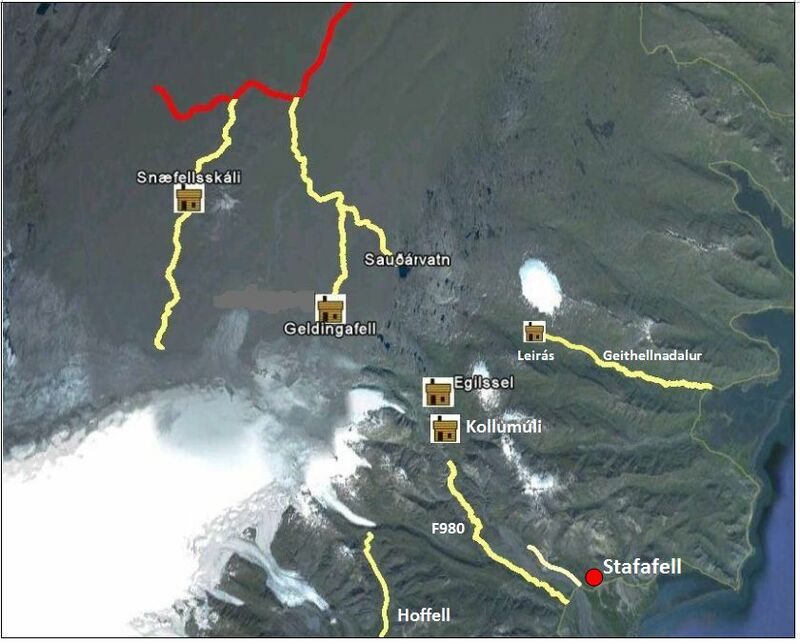 You can take road F910 to Snæfell (accessible to most jeeps) and walk from there to the Geldingafell mountain cabin. You can either walk across Eyjabakkajökull glacier (only for experienced hikers withe the right equipment, such as crampons, ice axes, etc.) or cross the river Jökulsá í Fljótsdal at the new bridge at Eyjabakkafoss. These trails are not marked. A jeep track which is accessible to most jeeps leads to the lake Sauðárvatn. From there you can walk to the mountain cabin "Egilssel" at the Kollumúlavatn lake. This trail is partly (and badly) marked with old cairns. There are no scheduled bus tours from Höfn or Stafafell to Illikambur (Kollumúli) any more. Two companies offer jeep tours to Lónsöræfi, Fallastakkur and Iceguide. Fallastakkur offers jeep transportation to/from Illikambur in Lónsöræfi and organizes also jeep tours on Vatnajökull. Transportation to/from Illikambur costs ca. 20.000 ISK per person, but can get a bit cheaper if more than 2 people travel together. Iceguide offers jeep and hiking tours to Lónsöræfi. Their 8-hours day trip costs 21.900 ISK per person (minimum 2 pers.). Iceguide also offers 4- to 5-hours trips to Lónsöræfi. For price and further information, contact Iceguide. 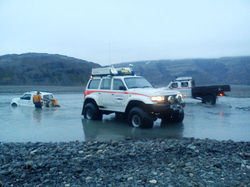 Two companies from Egilsstaðir, Jeeptours (http://www.jeeptours.is; info@jeeptours.is; tel. +(354) 898 2798) and Wildboys (http://www.wildboys.is; wildboys@wildboys.is) may be able to arrange transport to Snæfell, Geldingafell or Eyjabakkar. The tourist information centre of East Iceland can provide more information, tel. +(354) 471 2320.